The good news is that Catflu in dogs can be prevented with vaccinations and therefor vets recommend that all puppies start on a vaccination program from 6 weeks of age. If the puppies managed to take in the first milk (also known as colostrum) from the mother, in the hours after they were born, and the mother had been previously vaccinated or contracted the disease and survived, then antibodies or “soldier cells” will be transferred from the mother to the pups via the mother’s milk, which will offer the puppy some initial protection. This protection wanes over time and usually the levels are too low between the ages of 4 and 8 weeks to offer protection on its own, should the puppy be exposed to the Parvo virus. The first vaccination is therefore usually given around 6 weeks of age. This vaccination needs to be repeated monthly (also called booster vaccinations) for two to three months, to make sure that the puppys’ antibodies or “soldier cells”, which it got after birth from the mother’s milk, does not kill the vaccine and render it ineffective. Parvo virus is a really small virus compared to other viruses but it has a strong capsule around it, which protects it from the environment and which makes it incredibly tough to destroy. It can survive in the environment for up to six months to a year in a moist humid environment. The main source of infection comes from the stool of infected dogs. The virus is quite resistant to many cleaning agents but fortunately there are some commonly used household cleaning agents like bleach as well as swimming pool chlorine which work well to destroy it. If one suspects at any time that there may be some parvo viruses in an environment in which dogs are kept, it will be a good idea to disinfect the area with swimming pool chlorine. The parvo virus loves to attack the fast dividing cells in the body, and therefore symptoms of the disease are associated with the systems which are affected by the destruction of cells in these systems. The cells most commonly targeted are the intestinal lining cells (which in the normal course of events gets replaced by new cells every twenty four to forty eight hours), the lymphnode cells (which are like remote army bases around the body and assist in fighting local infection) and the bone marrow cells (which produce red and white blood cells and assist the body in fighting general infection and provides the body with its best defence system). The symptoms seen because of the virus attaching the intestinal lining cells are usually vomiting and diarrhoea (often bloody), which goes hand in hand with a loss of appetite and a rapid deterioration of the dog’s general habitus or status of well being leading to lethargy (sluggishness) and weakness. Damage to the intestineal lining prevents nutrients from being absorbed properly. 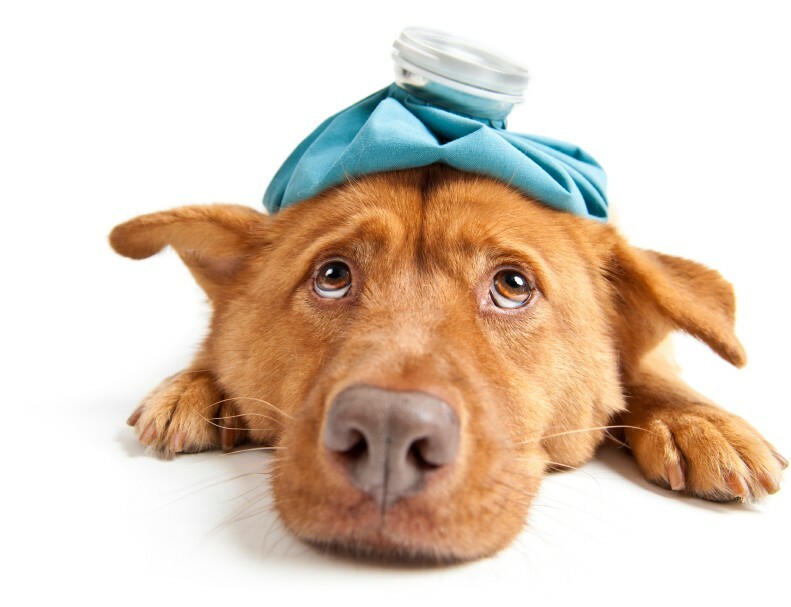 Because the defence mechanisms of the body are being affected by the virus attacking the other fast dividing cells in the body as well, the disease usually progresses fast and dogs contracting catflu can die of dehydration and severe infection within 24 to 48 hours. As with many other types of infections, a fever can often be present with catflu. The incubation period (the period from when the dog is first exposed to the virus and contracts it, to the time it starts showing symptoms) is usually between three to seven days. The challenge with treating dogs which have contracted catflu are that unlike bacterial infections, where antibiotics are very effective in killing bacteria, there are no systemic antiviral remedies which are effective enough to actively kill the virus. Therefore the killing of the virus (“enemy”) has to be done by the body’s own defence mechanisms – antibodies (“soldier cells”), which are produced in reaction to the virus attacking the body. This may take a few days and the only way to assist the body in this process is by giving supportive treatment like intravenous fluids replacing essential electrolyte losses, administering medication via injections which supports symptomatic treatment of the nausea (preventing vomiting and loss of body fluids), diarrhoea (preventing dehydration and loss of fluids via an overactive intestinal tract), and treatment with antibiotics to prevent secondary bacterial infection. Once treatment has started it can take anywhere between 1 and 10 days, to establish whether the animal will survive, often with a bitter life and death battle. If an animal presents to the vet in a dehydrated state to start off with, the chances are likely that the animal may not survive, even with aggressive supportive treatment. Treating the dehydration is only one part of fighting the disease. Because the virus attacks the bone marrow and destroys immune system cells, there is usually a decrease in white blood cells which means the body is almost defenceless. Add to that the destruction of the intestinal barrier (the cell lining of the intestines), which allows bacteria, which normally live in the gut, to freely access the bloodstream, leading to septicaemia and overwhelming infection, and you have a recipe for disaster. Some breeds of dogs seem to be more adversely affected than others and for some reason black and tan breeds like Rottweilers, Dobermans, German Shepherds and Miniature Pinchers are more likely to die than other breeds as a result of contracting catflu. Having said that, other breeds are by no means safe when contracting catflu, and the quicker you can get your dog to the vet once it shows any sign of disease, the better. The most important means of fighting the disease is prevention by vaccination. Effective vaccines which cover a wide range of virus strains have been developed and having your puppy and older dogs vaccinated at the correct times and intervals, can prevent this disease. Even though cats and dogs have been traditionally pitched against each other as arch rivals, catflu is one instance where the cats are innocent, and have been blamed for a killer disease they are not responsible for.